FUN TIMES By the Bay. BREAKFAST WITH THE EASTER BUNNY APRIL 13 JOIN US FOR A HOPPING GOOD TIME ! Camp Breeze offers kids a safe summer camp atmosphere to have fun, make new friends, and create a summer experience they will never forget! Themed activities include field trips, swimming, games, crafts, songs, dances, and more! Campers must bring a sack lunch, drink, 2 snacks, and swimwear each day, unless instructed otherwise. WHERE: Evelyn Kennedy Civic Center, 618 San Jacinto Street DATES: Monday – Friday for 10 weeks (Week 5 is Mon-Wed only) (1) June 3–7: Superhero Adventure (2) June 10–14: Game Show Mania (3) June 17–21: *This week’s camp will be combined with Camp Believe. It will be held at the Special Programs Center located at 1302 South Broadway. This camp will be an inclusion camp for ages 5 to 8. It is open to kids with or without an impairment (may include a hearing, mobility or vision impairment or a developmental disability) and able to function in a group setting with minimal instructions. Max for this week is 35 kids. (4) June 24–28: Pack your Passport (5) July 1–3: Stars and Stripes (6) July 8–12: Space is the Place (7) July 15–19: Camp’s Got Talent (8) July 22–26: Sports Spectacular (9) July 29–Aug 2: Under the Big Top (10) August 5–9: Color Wars TIME: 7:30AM – 5:30PM AGES: 5–8 *Child must have completed Kindergarten to attend* FEE: $60 per week (Week 5 is $40) MAXIMUM: 20 REGISTRATION DEADLINE & INFO: Register online at www.laportetx.gov/register or by visiting the La Porte Recreation & Fitness Center at 1322 S Broadway, La Porte, TX 77571. Register by the Monday prior to the first day of camp (at least one week in advance). Come embark on an adventure with us this summer! As a voyager, you will get the opportunity to participate in a wide variety of weekly themed games, events, and field trips, while making lasting memories with your new mates. Campers must bring a sack lunch, drink, 2 snacks, and swimwear each day, unless instructed otherwise. WHERE: Jennie Riley Community Center, 322 North 4th Street DATES: Monday – Friday for 10 weeks (Week 5 is Mon-Wed only) (1) June 3–7: Superhero Adventure (2) June 10–14: Game Show Mania (3) June 17–21: It’s a Pirate’s Life (4) June 24–28: Pack your Passport (5) July 1–3: Stars and Stripes (6) July 8–12: Space is the Place (7) July 15–19: Camp’s Got Talent (8) July 22–26: Sports Spectacular (9) July 29–Aug 2: Under the Big Top (10) August 5–9: Color Wars TIME: 7:30AM – 5:30PM AGES: 9–12 *Children that have completed 6th Grade and Under* FEE: $60 per week (Week 5 is $40) MAXIMUM: 24 REGISTRATION DEADLINE & INFO: Register online at www.laportetx.gov/register or by visiting the La Porte Recreation & Fitness Center at 1322 S Broadway, La Porte, TX 77571. Register by the Monday prior to the first day of camp (at least one week in advance). CAMP BELIEVE/BREEZE This camp combines our annual Camp Believe with Week 3 of Camp Breeze. It will be held at the Special Programs Center located at 1302 South Broadway. This camp will be an inclusion camp for ages 5 to 8. It is open to kids with or without an impairment (which may include a hearing, mobility or vision impairment, or a developmental disability) and able to function in a group setting with minimal instructions. A sack lunch, drink, and two snacks must be brought each day. Swimwear must be brought on pool days and field trip day. Max for this week is 35 campers. Any campers ages 9 to 12 WITH A DISABILITY must contact our SPORT office for registration. This week's field trip: Pirate's Bay Water Park WHERE: La Porte Special Programs Center DATES: June 17 - 21, 2019 TIME: 7:30AM – 5:30PM AGES: 5 - 8 FEE: $60 REGISTRATION DEADLINE & INFO: Register online at www.laportetx.gov/register or by visiting the La Porte Recreation & Fitness Center at 1322 S Broadway, La Porte, TX 77571. Register by the Monday prior to the first day of camp (at least one week in advance). Call (281) 470-9891 for additional information. SWIM LESSONS. BY THE BAY. ISR’s unique results are resource achieved through fully customized, safe and effective, one-on-one lessons with only your child and the Instructor. What your child will learn, and the way he or she will learn it, is what makes ISR so different from traditional swimming lessons. Always putting safety first, ISR emphasizes competence which leads to confidence, and provides the foundation for a lifetime of enjoyment in and around the water. INSTRUCTOR: Karen Littlejohn WHERE: Recreation & Fitness Center Pool DATE: By Appointment Only TIME: By Appointment Only AGE: 6 months – 6 years; private lessons FEE: $100 weekly REGISTRATION INFO & DEADLINE: For more information or to register, please visit isrlaporte.com or email k.littlejohn@infantswim.com. Visit her Facebook page ISR La Porte. SWIMMING LESSONS Classes are limited to 8 participants and will last for 45 minutes. WHERE: Various outdoor pools DATE: Monday – Thursday TIME: Various AGE: 6 months and older FEE: $25 REGISTRATION DEADLINE & INFO: Register online at laportetx.gov/register or by visiting the La Porte Recreation & Fitness Center at 1322 S Broadway, La Porte, TX 77571. Participants must be registered at least one week prior (the Monday before) to the first scheduled lesson. Please contact (281) 470-9891 for additional information!. PRIVATE SWIMMING LESSONS Private swim lessons offer one on one instruction from our most experienced certified instructors. It also offers the most flexibility by allowing you to choose the time that best fits your schedule. WHERE: Various outdoor pools DATE: Monday – Thursday TIME: Scheduled with instructor; four 30 minute sessions AGE: 6 months and older FEE: $60 REGISTRATION DEADLINE & INFO: Participants must be registered at least one week prior to the first scheduled lesson. Please contact (281) 470-9891 for additional information and to be paired with an instructor by the aquatics department. Online registration is not available for private swim lessons. TAAF YOUTH TRACK & FIELD Come join us this season as we compete at local, regional, and state level track and field events. This program is all about having fun and competing against other quality track teams in the region. Coaching will be provided as well as track shirts/jerseys! Meets will be on Tuesdays and Thursdays. Practice times will vary with each age group, which will be provided in the parent handbook upon registration. WHERE: La Porte High School Track DATES: Monday – Thursday, June 3 – July 25 TIME: Mornings Only (Practice times vary) AGES: 6–18 years FEE: $40 Early Registration; 55 Late Registration MAXIMUM: 200 REGISTRATION DEADLINE & INFO: Early registration runs April 1 – May 13. Late registration deadline is May 27. Register online at www.laportetx.gov/register or by visiting the La Porte Recreation & Fitness Center at 1322 S Broadway, La Porte, TX 77571. Call (281) 470-9891 for additional information. KARATE Sign your kids up for karate instruction sponsored by American Society of Karate. INSTRUCTOR: David Lange WHERE: Evelyn Kennedy Community Center DATE: Mondays, April 1 – May 20 & June 3 – August 5 Beginner Children: 6pm-7:00pm (Ages 5-11) Advanced Belt Children: 7:00PM-8:00PM (Ages 5-11) Teens/ Adults: 8:00PM - 9:30PM (Ages 11 and up) FEE: $50 Registration + $30 Uniform REGISTRATION INFO & DEADLINE: Contact David Lange at 281-850-4702 to register. PICKUP VOLLEYBALL/ PICKLEBALL/RACQUETBALL Reserve a court for pickup volleyball, pickleball, and racquetball. Nets and equipment will be available with a reservation and membership/guest pass. Reserve a court by calling the Fitness Center, (281) 470-9891 at least 24 hours in advance. Membership or day pass needed for admission. STORYTIME IN THE PARK Storytime in the Park is a terrific way to get children outside and more connected to nature. Join us in your neighborhood park where we explore nature with a book, activities, and games! All children must be accompanied by a parent or childcare provider who will participate in the program. INSTRUCTOR: Kayla Baez WHERE: Brookglen Park, 3324 Somerton Drive DATES: 2nd Wednesday of the Month: April 10, May 8, June 12 TIME: 10:30AM – 11:30AM AGES: 5 & Under FEE: Free! REGISTRATION DEADLINE & INFO: No registration necessary. However, as a courtesy, please call (281) 2455266 to confirm attendance for planning purposes for larger groups such as daycares. FAMILY PLAY MONDAY Finding quality family time can be difficult with everyone’s hectic schedule. Bring your family to a Family Play Monday at our Brookglen Community Center and we will have the activities scheduled for your family to enjoy. Activities include crafts, games, cooking and more! WHERE: Brookglen Community Center, 3324 Somerton Drive DATES: 1st Monday of the Month: April 1, May 6, June 3 TIME: 6:00PM – 7:00PM AGES: All Ages Welcome! Parent/Guardian attendance is highly encouraged! FEE: Free! REGISTRATION DEADLINE & INFO: No registration necessary. However, as a courtesy, please call (281) 245-5266 to confirm attendance for planning purposes. NEXT LEVEL DANCE SESSION 1: APRIL 1ST – 26TH SESSION 2: MAY 6TH – 31ST SESSION 3: JUNE 3RD – 28TH Join us this Spring for beginner and intermediate level ballet, jazz & contemporary, hip hop, acrobatics, teen contemporary (13+ONLY) and cheer and drill (12 and older only). AGE: 18 months – 2 years (Ballet Only) and 3 & Older FEE: $20 tuition + $25 annual registration fee; Package Deal – Any 3 classes for $55 per participant REGISTRATION INFO & DEADLINE: . Register online at laportetx.gov/register or by visiting the La Porte Recreation & Fitness Center at 1322 S Broadway, La Porte, TX 77571. For 18 months-2 years old, this class focuses on the basics of ballet, balance, and creative movement. The use of a gym mat, small fun props and a ballet barre will be utilized in Baby Ballet. Hip Hop class encourages dancers to express themselves through smooth, urban, and jazzy-funk movements while focusing on staging, visuals, performance and style. The most important part of this class is to ALWAYS HAVE FUN! Advanced classes are for more experienced dancers; instructors will recommend dancers be in beginner or advanced classes at their discretion. BALLET Dancers will learn the correct form of body alignment, technique, musicality, and line and grace while also educating them on the terms, language and vocabulary of this discipline. ACROBATICS Acrobatics focuses on strengthening and conditioning the body for tumbling and tricks, or skills, used in dance. The instructor will assist each student individually until the dancer can perform the skill safely and effectively without assistance. JAZZ & CONTEMPORARY During this class Jazz and Contemporary are fused together to focus on diverse training of technique, body isolation, strength building and performance. TEEN CONTEMPORARY This class focuses on all forms of dance and works for all levels and for ages 13-17! Intermediate classes are for more experienced dancers; instructors will recommend dancers be in beginner or intermediate classes at their discretion. V.I.P.A.R. 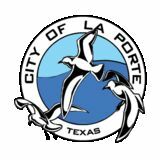 PROGRAM (Volunteers In Parks And Recreation) The City of La Porte is looking for the next generation of responsible candidates to assist with recreational programs, camps and events! If you’re 13-18 and would like to get involved or need community service hours for school contact us today. The V.I.P.A.R. (Volunteer in Parks and Recreation) program enable youth to build a foundation of knowledge, positive attitude, and skills that are needed to be a responsible volunteer. The V.I.P.A.R. will spend their time productively by assisting in recreational programs, events, recreation centers, athletics, and more. Check in once a week at Charles Walker to gather assignments. Ongoing Registration Age: 13-18 years Fee: Free Registration deadline: Ongoing For more information email: broughtonD@laportetx.gov or call the Charles Walker Center at 281-470-7545. REFIT PAC NIGHT The PAC will help you build a foundation, structure, and a support system that will fuel your personal journey for a lifetime. We are about building friendships, trying new things and celebrating milestones. If you're looking to experience new and exciting activities with friends, join us the 2nd Thursday of every month for #PACnight! WHERE: Norman L. Malone Senior Center DATE: Every 2nd Thursday of the month SESSION 1: April 14, 2019 SESSION 2: May 11, 2019 SESSION 3: June 13 2019 TIME: 6:30PM - 7:30PM AGE: All ages welcome FEE: $5 for non-REFIT members REGISTRATION INFO & DEADLINE: Contact thePAC@fitPacstudios.com for additional information. NORMAN L. MALONE SENIOR CENTER SENIOR MEALS MONTHLY ACTIVITIES Lunch is served Monday through Friday at 12:00PM for participants 60+ years of age. Registration is required at least 2 days in advance per our food vendor. Monetary donations are appreciated. Homebound seniors may request an assessment for qualification for home delivered meals by calling (281) 470-9897. Meals are delivered Monday - Friday. Monetary donations are appreciated. SENIOR EVENTS. BY THE BAY. SPECIAL PROGRAMS. BY THE BAY. The Special Programs Center is located at 1302 S Broadway, La Porte, TX 77571. This is a year round program offering day camps in the summer and after school/work programs throughout the year. We also offer an adult day program for independently functioning adults. The main objective of the S.P.O.R.T. (Special Populations Organized Recreation Therapy) program is to provide recreational activities, enhance fine and gross motor skills and create lasting friendships in a safe and structured environment for those with mental or physical disabilities. For more information call (281) 470-1579. We will be holding our annual Shrimp Boil to benefit our La Porte Special Olympics team. The plates are $12.00 and will include shrimp, potatoes, corn, dessert and drink. There will also be raffle tickets sold to win prizes. WHERE: Normal L. Malone Senior Center DATE: Saturday, April 6, 2019 TIME: 11:00AM - 1:00PM FEE: $12.00 per plate Tickets can be purchased at the La Porte Senior Center or at the La Porte Special Programs Center. SPECIAL PROGRAMS. BY THE BAY. This camp is designed for the preschool aged participant (ages 3-5) who has not competed kindergarten yet. This camp is designed for children with or without a physical or mental impairment. Campers without impairments must be sensitive to the needs of those with impairments. Activities will include arts and crafts, swimming, sports, games and life skills activities. ALL campers must be potty-trained. The camp will be held at the Special Programs Center from 9:00AM-3:00PM. The max for this camp is 12 participants. WHERE: Special Programs Center DATE: Monday, June 24 - Friday, June 28, 2019 TIME: 9:00AM-3:00PM Ages: 3-5 FEE: $60 Call (281) 470-1579 for additional information. This camp is designed for the junior high aged participant with or without a physical impairment (which may include hearing impairment, mobility impairment, or vision impairment). To attend this camp the child must be on grade level and able to function in a group setting with minimal instructions. Campers without impairments must be sensitive to the needs of those with impairments. Activities will include arts and crafts, swimming, sports, games and life skills activities. The max for this camp is 15 participants. WHERE: Special Programs Center DATE: Monday, July 8 - Friday, July 12, 2019 TIME: 9:00AM - 3:00PM AGES: 12-15 FEE: $60 Call (281) 470-1579 for additional information. CAMP CREATIVITY This camp is designed for the elementary aged participant who is autistic or has a cognitive impairment. This camp is for the child who is in a life skills setting or inclusion classes during school. Activities will include arts and crafts, swimming, sports, games and life skills activities. The max for this camp is 10 participants. WHERE: Special Programs Center DATE: Monday - Friday | July 15 – July 19, 2019 TIME: 9:00AM - 3:00PM AGES: 5-12 FEE: $60 Call (281) 470-1579 for additional information. CAMP WAVE This camp is designed for the teen or adult aged participant with a mental or physical impairment. The participant should be able to function independently in a group setting with minimal instructions. Activities will include arts and crafts, swimming, sports, games, and life skills activities. The max for this camp is 20 participants. WHERE: Special Programs Center DATE: Monday - Friday | July 29 – August 2, 2019 TIME: 9:00AM - 3:00PM AGES: 13-60 FEE: $40 Call (281) 470-1579 for additional information. ARBOR DAY TREE & SEED BALL GIVEAWAY Friday April 26, 2019 | 9:00AM – 2:00PM | Behind the La Porte Recreation & Fitness Center Come by the Recreation & Fitness Center and pick up a free tree and free seed balls: each seed ball is loaded with seeds that can be used to start your own pollinator garden! Supplies are limited so come early. Sponsored by Trees For Houston and the City Of La Porte. 2 Security Officers are required for any event where alcohol is present. 1 Security Officer is required for any event hosting 61+ guests. Security is NOT required for events hosting 1-60 guests without alcohol. Security Fees: $40 per hour, per officer (3-hr min.) Alcohol Permit (REQUIRED): $25. 1508 LOMAX SCHOOL ROAD RENTAL DATES: SUNDAY - SATURDAY | 8:00AM - 12:00AM RATES: MONDAY - THURSDAY • $150 per day; $200 Deposit FRIDAY - SUNDAY • $200 per day; $200 Deposit Electrical Box • $20 per box per night Electrical Box includes: 1 • 50 amp, 1 • 30 amp, & 20 amp duplex. (11 total boxes) MAX OCCUPANCY: 80 Persons MAX SEATING: 50 Persons AMENITIES: 10 • 8' Rectangle Tables *Concession stand is NOT included in any rental of the Lomax Rodeo Arena. For information regarding the usage of the Concession stand, please contact the La Porte Livestock Show & Rodeo Association at 832-309-0436. ORDINANCE 2016-3620 • Open riding is available during arena operational hours of 7:00AM and 11:00PM, with the exceptions of those dates and times that the arena is leased. • Those wanting exclusive time in the arena shall be required to rent the facility. • No paid, private instruction is allowed for any person during open riding, in accordance with section 50-3(3), unless the person has rented the arena. • Use of bucking chutes for rough stock is not allowed during open riding. • No glass bottles are allowed on any portion of the Livestock/Rodeo Arena grounds. • Certificates of Insurance are required in connection with all rentals of the arena where the lessee brings an animal or animals to the facility. • Rentals will be posted on the bulletin board by the concession stand on a weekly basis. SECURITY GUIDELINES Outdoor facilities such as Rodeo arena events, permitting alcohol are required to have 1 Security Officer per every 100 persons, with a minimum of 2 Security Officers. Monday - Thursday 7:30PM - Midnight Friday - Sunday 6:30PM - Midnight Deposit: $100 Rates: $125/hr (2hr minimum) Max Occupancy: 600 Guest Security Fees: $40 per hour, per officer Alcohol Permit (REQUIRED): $25. No glass containers allowed. Pools reservations begin April 25, 2019 for La Porte Residents & April 29, 2019 for Non-residents. The first available rental date for all pools is June 3, 2019. 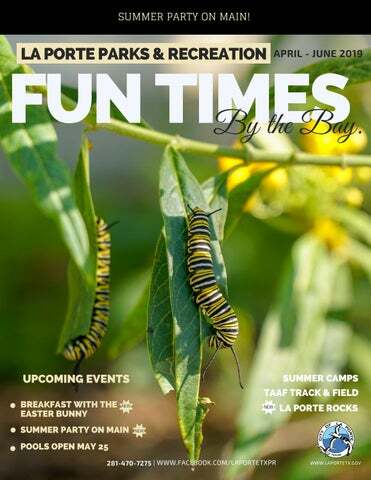 City of La Porte Parks and Recreation Program Guide for April, May, June 2019.